RedBeam was founded in 2004 and has experienced incredible growth in their first decade of operation supplying data collection applications to the government, education, and healthcare industries. Since the launch of their first packaged application, RedBeam has served over 10,000 customers – all while staying true to the business’ core beliefs: Deliver exceptional value to each and every customer, and be a joy to do business with at all times. These beliefs have allowed RedBeam to build an extensive track record of extraordinary customer service and outstanding software innovation. 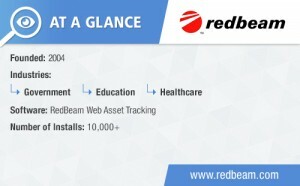 RedBeam Web Asset Tracking: RedBeam’s web-based asset tracking solution delivers the functionality customers want, the way they want it. The robust software allows businesses to use barcode and/or RFID technology to track their assets in real-time from any Windows Mobile, Android, or iOS device. RedBeam also utilizes the secure and reliable Microsoft® Azure™ Cloud, so customers have the tools to efficiently track the location, quantity, and condition of their fixed assets in real-time. RedBeam also offers a PC-based version of their asset tracking software for those who do not wish to use an online system. If you are looking to track your consumable stockroom inventory, RedBeam also offers Inventory Management software. RedBeam Inventory Management makes it easy to monitor the sale or consumption of items, avoid shrinkage, and to take full control over business operations. The added efficiency that this inventory control software offers can directly lead to higher profits, more accurate business data, and improved security and visibility. RedBeam software, particularly Web Asset Tracking, presents a significant opportunity for partners looking for a channel-friendly way to start making money through a recurring revenue model. At this time, RedBeam is actively looking for resellers that can provide industry or market expertise at a local, national, or international level. If you are interested in becoming a reseller, contact RedBeam at sales@redbeam.com or (877) 373-0390. Next Wearable & Mobile Technology Expected to grow 20% - Learn how Honeywell Can Help! James Korte is a guest author at VARTECH Nation, a design thinker, voracious reader and technology enthusiast. Previously, James has worked in product development, marketing research and professional sports. His interests include: everything digital, travel, videography and ice hockey.